Pierre Joubert was born in Paris in 1910. He was a member of Paris Boy Scout Troop #14. He drew images of Scouting as an actual Scout. His first amateur drawings were published in the magazine "Scout de France" in 1926 and in a book. He attended l'Ecole des arts appliqués (School of the Applied Arts) in Paris. Joubert worked for the magazine L'Illustration (The Illustration) beginning about 1930. Soon afterwards, Jobert focused on illustrating Scouting publications and books as well as illustrating other literature connected with the Scouting movement. His adventure book illustrations is most associated with Signes de pistes (Trail Signs) editions. He also created hundreds of drawings of French youth, and became famous for his stylized model of teenagers. He became the "official" illustrator of Scouts in France for fifty years. 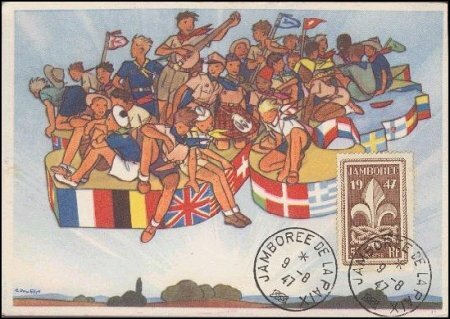 Joubert's illustrations for Scouts de France were published on Scouting postcards. Perhaps his most famous work with international recognition dates to his postcard series for the 1947 World Jamboree hosted by France. Many Scout topical philatelists include Joubert in their collections. The German Nazi banned Scouting after the invasion of France at the start of World War II. Joubert however attempted to remain active with the Scouting movement. He did this by moving to the Vichy region where Scouts de France was permitted under the control of the extreme right Petainist (Maréchal Pétain) government. He was not known to have participated in the Pétain government, but he was to carry the burden of guilt by association for collaboration the rest of his life. 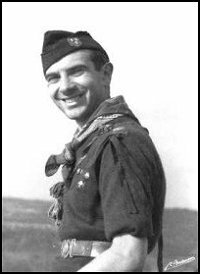 Some Scouts and citizens who fought with resistance movements throughout Europe or suffered under the Nazi or Vichy continue to say the name "Joubert" with distain. Joubert passed away in 2002 at the age of 91. Tributes to his memory were published in France and Italy by Scout newspapers and websites. In his obituary, the respected Paris newspaper Le Monde referred to him as "l'illustrateur du scout modèle," (the illustrator of the model or ideal Scout).